The influence. The phrase alone is ambiguous and moving, is it not? Well at least I hope so. My name is Sekina Ward (Dj Sekina Milan) and I am a new Dj with KSSU. I am super excited to be a member of the KSSU family and create my show’s identity with a spiritually elevating approach. To explain my show, I need to share a little about myself first. I am a student here at Sac State (clearly) and I major in Mass Communications. What made me gravitate toward KSSU was the need for experience in public speaking and communicating to a larger audience. My plan is to become a motivational speaker on spiritual healing, producing mass success, and creating an authentic self through meditation, love, and gratitude. My focus for my future career is and will be the basis for my show called The influence. The idea behind The influence is we as organic matter, as forces, and as constantly flowing energy have an impact on the world around us with every action, decision, and thought we release into the universe. How we live our daily lives has a direct effect on the universe, just like a tear drop in a pool of water, it spirals and spreads to the rest of the body of water. That is why when we look at the current condition of this planet, we see much pain and suffering. Humanity has become entrenched with greed, power, anger, and hatred. By no means am I pushing for political action, but I am explaining the philosophy behind my message. As a result of the mass suffering, anger and hatred spreads, sending us all down a vicious cycle of self-inflicted pain. It shows in everything we do and believe in. Our economy is fueled by competitive capitalism, we destroy our planet with pollution, we are divided by classism, and we declare war on those we do not understand. As depressing as this may sound, just imagine if we shifted our way of thinking. What if our economy was driven by love, community, and compassion. What if we invested in environmentally friendly fuels and pushed for a universal energy system. What if our government invested more in educating our youth, rather than big corporations. Most of all, what if we promoted a culture based on love and gratitude? What if people were happy and healthy? What if most people took care of their spirits through meditation and educated their minds? We would live in a very different world. This fantasy world is not much of a fantasy at all, in fact it is only a thought, a decision, and an action away. If we all were healthier, happier, and in a better state of being, our vibrations would be higher and we would release positive energy. One at a time, we would influence each other to grow into the highest versions of ourselves. With meditation, love, and gratitude, this dream is possible. My show The influence will promote this idea and hopefully turn it into a reality, especially for those who tune in (wink wink). I will also include other topics such as astrology, politics, poetry, and of course music. Expect to hear a lot of Alt/indie, Hip Hop, electronica, and R&B. Most of my music will reflect the theme of my show, but every once in a while I’ll drop a trap song or two (clean versions of course), so don’t get too shook. My show is every Thursday at 9am, which is a perfect way to get your day started. I hope you guys find a little piece of yourself within my show and that I uplift your spirits. Oh and remember, stay one with the universe. It’s sad to know that Summer fun is over with and its’ back to the grind with Fall 2016. However, it’s not completely bad that Fall 2016 is upon us; in December, I will be graduating with my bachelors degree in Communications and minoring in Psychology. All the hard work, blood, sweat, and tears at Sacramento State is finally going to pay off. I can see the light at the end of the tunnel! However, let’s do a recap of my Summer 2016. For starters, at the end of Spring 2016, I attended the Bernie Sander rally at the Sacrament Cal Expo. During a time where political debate is high and presidential candidates are going to be voted on in November, I felt that it was necessary to attend the Bernie Sanders rally. To be honest, I am not very political and I am not very happy with the candidates we have to choose from, but listening to Bernie Sanders speech was very insightful and shed light on economic topics that I had never considered before. I didn’t attend this rally to be a band wagoner, but more so to learn about a candidate that I thought fit the middle road between Hillary Clinton and Donald Trump. Overall, the rally was fun to attend and I learned a lot about the possibility of change within our country. Beyond the Sanders rally, I actually was a part of some fun activities. For instance, my girlfriend Jessica and one of my best friends, Devin visited the South Yuba River State Park for the first time where we were able to lounge in some watering holes and float in our inner tubes down a few rapids. This place was really cozy and not crowded by tons of people, which made it relaxing. We packed enough food for the afternoon, had lunch, jumped off some rocks into the water, and headed home for the day. Overall, it was the perfect day escape when the temperatures in Sacramento were 100 plus degrees. Next on the Summer list was Pokemon Go. This app took me by storm. For those who don’t know, Pokemon Go combines the feature of geocaching with the means of catching Pokemon characters. Mind you, I never grew up watching Pokemon or playing with Pokemon cards, so Pokemon Go was completely foreign to me. When I initially started playing, I had no idea what I was doing and luckily my friend Amanda is a comic nerd and she educated me on everything Pokemon related. What started out as this fun app quickly turned into an addiction of wanting to “Catch Them All”. Ne arly every night that I was not working, I would spend evenings in Davis parks, the Woodland Cemetery, and Old Sacramento attempting to spin Poke Stops and catch Pokemon over and over again so I could keep leveling up. Eventually the problem got so bad that I racked up a nice data charge on my phone bill. Ha! It was at this point that I had to do some self-reflection and wean myself off of playing Pokemon Go. The game in general is extremely fun, but super addicting and it makes it hard to play during the semester when you’re balancing work, school, and organizations that you are a part of. Another fun event that I was a part of this Summer was taking my 89-year-old Grandpa to Yosemite National Park. We collectively went as a family and got a chance to see Half Dome and El Capitan. We stayed at a cabin within the park for only two nights, but we packed in as much sightseeing as we possibly could, including hiking to Yosemite Falls. Between traveling and working as a server at a restaurant, I spent my free time hitting the gym religiously, teaching myself Spanish, going out to restaurants with friends, and viewing the latest films of the Summer. In sum, I feel that I had a pretty successful Summer and I am looking forward to graduating in December. Sacramento State University has been one of the best chapters of my life. This is not the tree Tex cut down, but it is a tree. I would imagine Tex’s tree was also made of wood and possibly had leaves on it. I do not enjoy exercising. I have never been a person who gets any sort of rush from running on a treadmill, climbing up infina-stairs, or pumping iron (or any other element for that matter). This is not my excuse, but I have always found it funny that when we “work” out we are not really doing anything. Nothing actually gets accomplished, no houses built, no statues erected, not even the weights themselves properly re stacked on the G-darn racks when people are finished. The only thing that gets “done” is our bodies exhaustion, which of course is the point of exercise. This past spring break I had the opportunity to exercise my body by pulling down, chopping up and hauling away a ready to fall tree in my backyard. I jumped at the chance to give my lethargic body a chance to get a workout and accomplish something at the same time. But the mistake I always make when preparing and looking forward to any physical excursion is underestimating how difficult it will actually be. The skinny pine tree was about thirteen feet tall. It started leaning towards the house after my Father chopped up some of the roots on one side to clear away room for the shed that he was building. 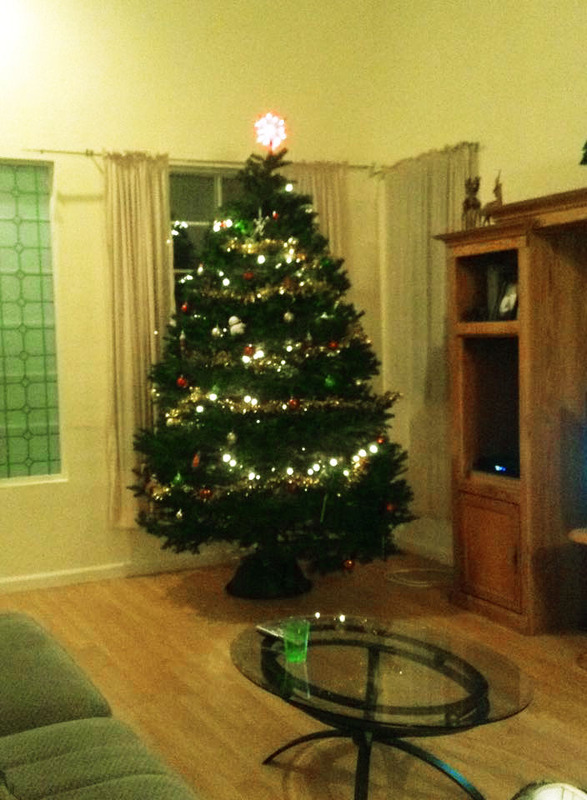 Before long the tree would fall on its own so we made the decision to pull it down ourselves. Climbing up the ladder that leaned against the tree I thought that it would collapse under my weight. Each step I took shook the tree as I climbed up to secure the rope to pull it down. The tree itself was stubborn. It refused to uproot even as we pulled and pulled. Unfortunately I forgot to say timber, even though we were not chopping down the tree. The roots still anchored the tree into the freshly churned dirt. I climbed up on top of the tree and jumped up and down, stretching the roots but still the tree remained anchored. My Father and I pushed and pulled the tree around its anchor point. The taught roots twisted, snapped, and popped from their place in the ground, weakening their grip on the collapsed tree. But still the roots held their tree in place. I went to the garage and returned dragging an ax across the floor like a last ax murderer (yes I really did this just for giggles). My dad held down the tree I chopped away at the last roots clinging to the ground. Dirt flew in my face with each swing, but the tree came loose. We pulled the tree from it’s hole in the ground and started cutting it into smaller pieces. I thought that cutting a tree would be easy work. Each swing brought down the ax with a large thud and the handle trembled and shook in my nervous hands. Again and again and again I swung the ax, cutting deeper and deeper into the tree trunk. I was exhausted and my hands were aching, but I wanted to finish. Finally the ax struck past the hardwood to the soft ground beneath. I stood up, elated that I had cut through a tree (a skinny tree granted, but a tree nonetheless). My mother claimed the bottom section of the tree so she would place candles in the truck for decoration. I claimed the top two pieces and am now working on whittling one down into a wooden practice sword and the other into a spear. I have always wanted a spear. Tex is a dj with KSSU where he does the dj things. Hey there! My name is Angelina, otherwise known as DJ Rivers. I am a new DJ here at KSSU and excited to be a part of this awesome community. Since I am a newbie here, I think its best that I properly introduce myself. I am a second year student at Sac State, but I am a junior (hopefully graduating next year) majoring in communication and minoring in business. All those advanced placement tests in high school let me skip a year in school and I’m incredibly thankful for it. Sac State offers so many opportunities and I am gladly taking advantage of this one here at KSSU. I’ve loved my experience here thus far and look forward to getting more involved on campus. Good Afternoon everyone in radio land! My name is Christian Colón and I am one of the many new DJs joining KSSU this semester. This is one of my first blog posts, so I thought I’d give everyone a little background information about myself, the type of music thats in current rotation for me and what to expect from my show once I get on the air. Well to start things off, I am a California native, born in Northern California quite some time ago (please don’t ask when). I grew up most of my life in California and then moved on to Texas in my teenage years. Like many kids I didn’t really have a clear idea of what I wanted to do with my life, so I decided to follow in my Fathers’s footsteps and join the military, specifically the Air Force. During that time I learned a great deal about the world, was able to travel to some very exotic locations, and narrowed down some of my life goals. I served for eight years, and recently separated back in 2012, deciding to settle down back in Sacramento for the time being. Armed with the skill set I gained from the time in the military, I decided to pursue my bachelors here at Sacramento State. I am currently in the Business Administration program, with a concentration in Accountancy. I am projected to graduate in Spring 2017 and can’t wait to get back into the work force. Now that I’ve given a sufficient background on myself, lets all talk about something we all enjoy, which is music. With so many genres out in the world today, its really hard for me to focus on one specifically and honestly I find myself gravitating to anything that sounds good these days. For the sake of saving time on the readers behalf, I’m going to focus on a genre that you can expect to hear me playing a lot on my show, which is Synthwave. What is Synthwave you may ask? Well imagine sounds from the 80s, movies like The Karate Kid, Goonies or Top Gun. They typically have a very upbeat, incorporating synthesizers and are primarily instrumental with some vocals here and there. Usually upon your first time hearing a synth wave song, you’d believe that it was song made in the 80s and I always imagine that’s the artists goal when making the song. Its to invoke the carefree feelings of 80s and makes you want to barrel down the highway in a Delorean. Lastly, my show will incorporate sounds from the 80s, 90s, chiptune, synthwave, electronic and new wave to name a few. I’m also a fairly talkative person and not shy behind the mic, so expect to hear my voice fairly often over the airwaves. I’ll incorporate some discussion about games,music and other relevant topics going on. One thing you will learn about me after tuning in is that I have a serious passion for music and am always open to hearing new artists. My goal is to listen to someone new at least once a week and I’ll be looking to you the viewers to have a helping hand in that. If you have someone you really like, comment and share them with me, and who knows you might even hear them on my show. I appreciate you all taking the time to learn a few things about me and I’ll be sure to drop some more info about in future shows. Till then, this is DJ Ace signing off. Being a first year student, I already knew what major do I want to go in, but I wasn’t too sure what I really wanted to do in the field. What I had decided to get into is Theatre. How did I come about that choice? Well, let me just bring everything back before I even gotten into college. At first, I didn’t have any ideas what to do in the theatre. All I ever knew was just working behind the scenes, being a part of the crew and production. 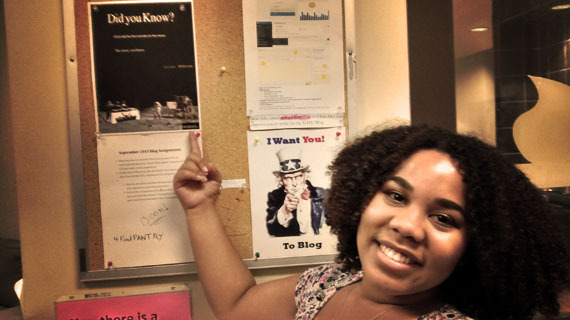 I was interested in being a part of the theatre because I treated this major like student government, which was what I experienced my entire time in high school. Being in student government, I am used to working in teams to get a task done. That was how the system always worked. We would set up and outline ideas for a show like school events and rallies. We would run rehearsals for the events. Everything’s all practiced and planned, so when the day came, we put the show out. Even if we messed up, we continued to get the show running. That’s my favorite part of being in student government. Help the needs and then run the show by observing everything and everyone. For what I want was to find a major that I can do something similar to that. 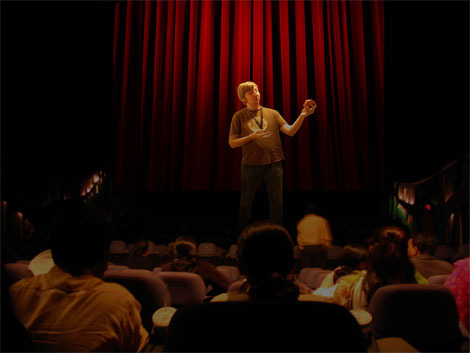 Theatre was a way for me to continue that group work to put up a show. Coming into Freshmen Orientation, I had that mindset on. I then finalized that I was able to go into becoming a stage manager for the show. I was always leading the students in student government like a stage manager would do and I was always just watching in action. That was my motivation for the first time. Stage Manager sounded really great and exciting. You get the chance to run everything yourself this time. In September, there was even an offer for stage manager position from department chair of Theatre for the upcoming play that she was directing. I really wanted to do it, but I thought hard about my consequences of if I took on this path. Yes, it would be fun to experience of being the stage manager, but would I be able to handle the stress? I was taking two lecture class and a seminar class. That I knew right away, I wouldn’t stand a chance. It’s not because I had low expectations of my abilities, but I didn’t want to build stress in me. It was my first year and I didn’t want to push myself to the limits of being a stage manager. I passed up the offer. Did I regret it? No, I am thankful with my decision. There’s a long way for me to go and if I really wanted to do this, I probably will or will not. At the time, I had no idea what to do now with theatre. I was unsure, and it is fine to be unsure about your major, especially when you’re just a first year. I just decided that stage managing is not the right time now, so I just thought to stick with my original idea of being a part of the crew. It wasn’t until I began taking Theater History 2 this semester with Dr. Pomo when I discovered my admiration with costumes. In this course, I had definitely fallen in love with Sanskrit Drama, Yuan Drama, and the Japanese Drama (Noh, Bunraku, and Kabuki). Their costumes were amazing. The Sanskrit Drama were full of arts because of how the actors and actresses move around gracefully with their colorful costumes. I find that so catchy because the color represents their character. This goes the same with the Yuan and Japanese Drama. The colors are symbolic to a specific character trait like green stands for demon and black stands for courageous. The Asian Theatre is just too beautiful to pass up. With the love of the colors and designs, I decided to take costumes as my concentration in my major. When people questioned me, “You’re a Theatre Major? Do you like to act?” When I answer no and explained that I am interested in the production. The next question would be, “Do you want to be a director?” No, no, not anymore. I am into stage managing and all of those good stuffs, but I am not focused in that. I tell them specifically about the interested of costuming and styling. For this concentration, there are skills I have to know. I have to learn how to sew. I’ve done sewing a few times because I try to tailor my long pants, but it never turned out to look professional. Instead, it looked really lame. I also need to understand specific of fabrics and tools, all the needs I need to understand. Speaking of which, I am thinking about becoming a Fashion minor. That way, I can further build onto my costume knowledge. That is the plan. I am able to connect Theatre and Student Government together. It’s all of natural thing to do when I get into a group together and work things out. I get to associate with more people and can get closer. I am so proud of saying that I am a Theatre Major because I love how the entertainment can present stories and folktales into a production play that is artistic. Theatre is a form of art that expresses emotions through dialogues, music, dance, and simply just a playwright. I don’t care if Theatre does not make high incomes like other majors do. This field is all about understanding and appreciating the art. Looking at me, of course, you wouldn’t expect my interest of being a Theatre Major and being a Fashion Minor. I mean, just look at my style. I do not match to be those types, but don’t judge anyone on the outside right? It’s just something I’ve been thinking and reflecting on myself. This is what I am looking forward to do. Even if I had no idea at the beginning as a new Theatre Major of what I was going to do, I know that I have made a choice that’s my own.Thanks to Theatre History 2 Lecture class, I was able to plot these out. I’m satisfied with my decision. This is not Melanie Weaver, merely a reenactment of what Melanie Weaver would look like if she was pointing at a poster. Hey everyone! 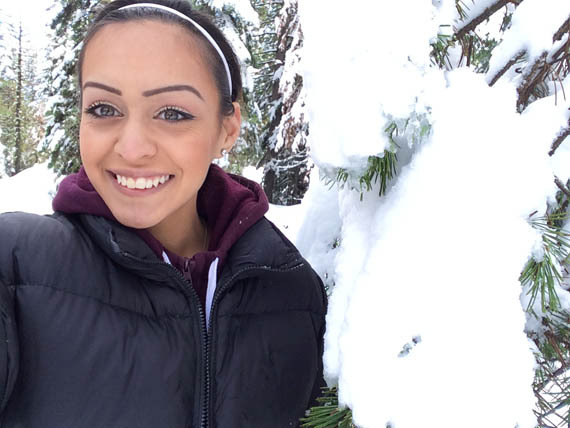 I am Melanie Weaver, a junior at Sacramento State. This is my first semester at Sac State, and I am a liberal studies major and history minor. I decided to become a DJ for KSSU because I have had a passion for broadcasting since I was in sixth grade. I had a friend who was co-hosting a show on a classic rock radio station that was located in Westwood, CA, and I was interested in being a guest DJ. I have been on the radio off and on since 2004. Being a DJ is something that I have been interested in doing in my spare time because it’s fun. When I was a senior in high school, I was required to do a senior project. I had an idea in mind and that was to work for the community radio that was located in Quincy, CA. I had gone to the meetings that were required for the new DJ’s. I was one of the youngest DJ’s that was part of the volunteer staff for the radio station. I am happy that I am a DJ for KSSU because I enjoy being on the radio and playing music for the listeners. I host The Melster Mash every Wednesday from 5pm to 6pm on KSSU DOTCOM on the TuneIn radio app. The music I play on the show comes from music that I enjoy listening to. I am very happy that I have come this far and enjoy working for KSSU as part of the volunteer staff. It’s amazing and I like to do this during my spare time. I hope you continue to listen to my show every Wednesday from 5pm to 6pm on KSSU DOTCOM. I am playing music from the 80’s, 90’s, 2000’s, 10’s, and today. Definitely worth listening to. Thank you to the fans who have listened and the ones who will be listening. 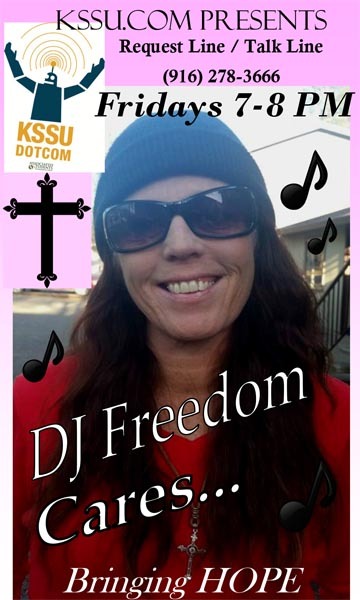 Keep it tuned to KSSU DOTCOM for awesome shows by our current DJ’s for KSSU. Greeting KSSU listeners. I have been enjoying my new DJ experience. It has really brought out a new creativity and thought in my personal life. I am CHANGING time slots for Fridays 5- 6 PM to 7-8 PM!!! I have had a great response to my show however the time slot was difficult for most to listen. I realized that this commute time, dinner time and very busy time. So i am changing it to a later time in hopes of reaching more listeners. I have also finally finished my DJ Flyer and they will printed soon so I can spread the word of my new show!! The format I have chosen is to be bold and declare and share my faith to those listening. Although I do play some classic rock most of my playlist is christian music. So far from my friends that are listening at home they have been extremely blessed and this encourages me to reach more listeners. My faith in God and all that He stands for is who I am today. If it weren’t for Jesus and the grace I have found I would not be here today. I would have died long ago.The strength and hope that I have found in Jesus give me the ability to continue down this path called life. It is my heart to share hope with the hopeless to encourage the desperate and lonely that they are not alone. I not only understand but can relate and want to share my experience, strength and hope to others. Each week I chose a topic to discuss. So far I have shared about gratitude, grief and joy. It all depends on what’s going on in my own life for that week. I am very transparent and believe that with sincerity and true experience others can be encouraged in their own lives. I will be opening the phone lines in hopes that listeners will call and participate in the topic of the week. The goal of my show is to have an interactive radio show. It is a big goal and we will see how this is going to work.I truly put my heart and soul into my show. My heart to help and bring hope is a burning passion that I carry deep within me. So tune in to KSSU.com on Friday Nights 7 – 8 PM and give my show a shot! !